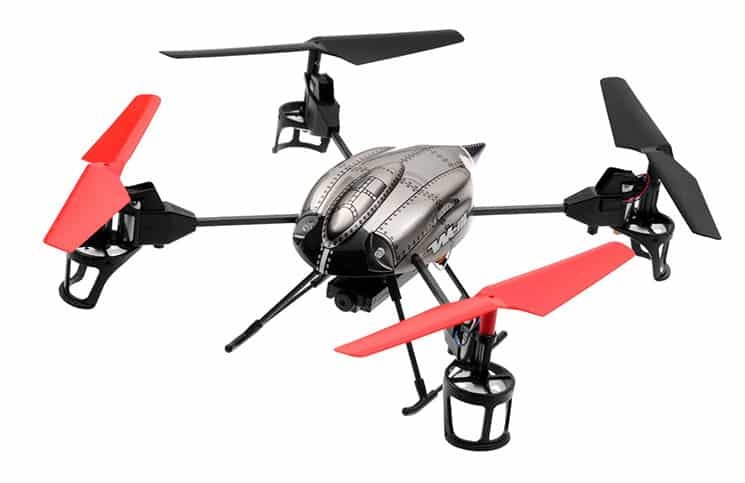 The WL Toys V959 quadcopter is a medium sized drone that can be flown right out of the box. You can even add a camera if you wish. It has a grey metal body casing and two red and two black blades. There is an antenna that sticks out from the front end. Two landing tracks extend down from the body to protect the quad while landing. Pricing is under $70, which is a pretty good deal. Add on the camera, which comes with an SD card for additional cost. While this quad is lightweight, it’s still sturdy enough to carry a camera. The quad can be upgraded with an HD 720 p camera that can be ordered separately. You can also add other modules to your quadcopter. The six axis gyroscope provides stabilization for your quad, while it’s in the air. If you’re curious about quadcopters, and it’s your first purchase, the WL Toys V959 quadcopter will be a great choice. Not only is it lightweight, but it’s easy to fly as well. It’s constructed of durable plastic and elastic materials, so if you accidentally crash it, or fly it into a wall, it’ll simply bounce back. Each of the four rotors are protected by plastic housings. The rotors are driven by gears, which eliminate stress on the motors. These materials help to encase and protect the motors, which is probably the highest cost to replace on a drone. If you should damage those, these are easily replaced. If you should damage your WL Toys V959 quadcopter, it’s possible to order spare parts for easy repair. The radio controller allows you to adjust the control sensitivity. This quad is perfect for all skill levels, and there will be plenty to interest the pro pilot too. You can perform flips and rolls with the press of a button. The WL Toys V959 quadcopter has a six axis gyroscope which is fairly standard on many moderately-priced quads today. The gyro will help to keep your quad steady in the air, even when you’re just learning how to fly. It will help to keep the quad steady and balanced in the sky. This is particularly important if you have decided to add an additional video camera, so you can now have nice stable video footage, and sharp clear photographs. You’ll be able to add other modules to your WL Toys V959 quadcopter, including a bubble blower, a missile shooter, water canon, crane, and basket. You may wish to avoid flying your WL Toys V959 quadcopter out in heavy winds, particularly if its carrying extra accessories. The WL Toys V959 quadcopter has built in LED running lights so it’s easy to keep your orientation in the air. This also gives you the capability to see your quad even at night time. Your WL Toys V959 Quadcopter can do cool tricks with the 360 degree flip function. All you have to do is press a button and watch it roll. You’ll be able to impress your friends, and you didn’t even have to do any intricate movements of the control stick. Besides the tricks, you can still do the normal moves with your quad: up, down, left, and right movements. There is also connectivity to other drones, if you have your entire family on the flying field. Should you choose to add a camera, it will be mounted on the bottom of the craft. The V959 camera has an adjustable lens, so that it can capture some fantastic aerial footage. If you wish to add the camera, it has some great features. It is 720p HD camera integrated. You’ll also get a two gigabyte SD card, so you won’t have to buy that separately. You’ll also get a USB card reader, which will help you to manage your video and photo data. Inside the box you’ll find one WL Toys V959 quadcopter, a 2.4GHz remote controller, a battery, four extra rotor blades, a paper user manual, a charger to charge up your quad, and an HD camera and a 2GB SD card for the camera if you chose to order the quad with the camera option. The controller has four channels, so you can fly it on the field with other drones and not have to worry about radio interference. The propellers don’t look like your standard rotating airplane propellers, they’re much wider, to help keep the drone in the air. You’ll be able to fly your WL Toys V959 quadcopter out to a range of one hundred to one hundred and fifty meters. With one full battery charge you’ll have about eight to ten minutes of flying time. The WL Toys V959 quadcopter measures 305 millimeters long, and 305 millimeters wide. It measures 80 millimeters in height. The quad is lightweight and weighs only 65 grams. It comes with a built-in 3.7 Volt 500 mah Li-Po rechargeable battery. You can buy a wide range of spare parts for your WL Toys V959. Everything from the camera, to bubble blower, bearings, LED lights, main frame, motor, plugs, landing skid, charger, and cables are available. If it can be lost or damaged, it can be replaced. So, don’t worry about your sloppy flying—get out there and learn without any worries! WLToys provides support for all the drones they sell. Simply send an email to [email protected] and they’d be happy to assist you with any questions. Are you looking for a great full-size quad but don’t want to spend a lot of time on customization, or have one that is palm-size? If so, the WL Toys V959 quadcopter should have enough to interest both the beginner and the intermediate drone pilot. The quad is durable, and has many spare parts and accessories, so you can keep flying your quad for years, even if it does get a few bumps and dings from time to time.